An unforgettable experience, observing the worlds most precious landscape jewels through your camera. Bucket List: You have heard of the world's driest desert, and stargazing is one of your favorite activities. Plus you have always wanted to visit Chile. Travel Vision Journeys with Ossian Lindholm and Lauren Hefferon invite you to visit, the great Treasures of the High Plateau; that surrounds the area of San Pedro de Atacama Chile and an approach to its neighbor country, Bolivia. Magnificent salt flats, lagoons, volcanoes, rock formations and boiling waters that emerge from the heart of the earth, and we will discover the mysterious rhythm of sunlight, and the appearance of the moon. An unforgettable experience, observing the world’s most precious landscape jewels through your camera. Sandwiched between the Pacific and the Andes, the incredible landscape of Chile’s remote Atacama Desert is like no place on earth. With its jagged, rust-colored ravines, vast, rocky, white salt pan and volcano-topped horizons, you would be forgiven for drawing comparisons with places beyond our atmosphere. 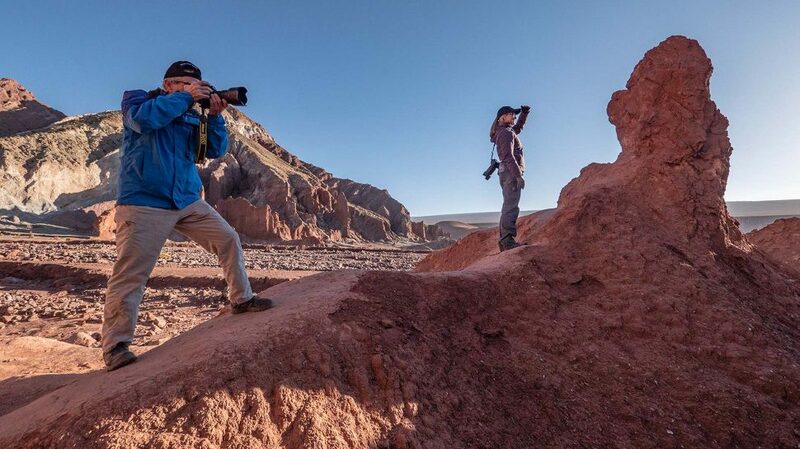 Its extreme terrain and arid environment – the Atacama Desert is one of the driest places on the planet – means there is little in the way of human development, making it the perfect spot for photographers who are keen to get off the beaten track. The small town of San Pedro de Atacama, in the heart of the desert, makes a great base for exploring this fascinating region and checking out some of the awesome adventures it has to offer. The Atacama Desert is also one of the best places in the world to stargaze. With cloudless desert nights and an absence of light pollution, it’s clear to see why some of the most important observatories on earth are located here. With the naked eye alone you can see thousands of stars and make out the pale mist of the Milky Way. Unique landscape photography at sunrise and sunset of salt flats, lagoons, volcanoes and geysers. The El Tatio Geysers: a geothermal field of fumaroles, small geysers, multi-coloured craters with nearby hot springs inviting to take a comforting bath after walking the crater landscape. Opportunity to photograph some of the andean wildlife: vicuñas, guanacos, rheas, flamingos and foxes. The oasis of San Pedro de Atacama is an absolute “must“ to visit; it was the centre of a Paleolithic culture that built impressive rock fortresses on the steep mountains encircling the green valley. San Pedro de Atacama is one of Chile’s most important destinations, alongside Torres del Paine National Park and Easter Island. 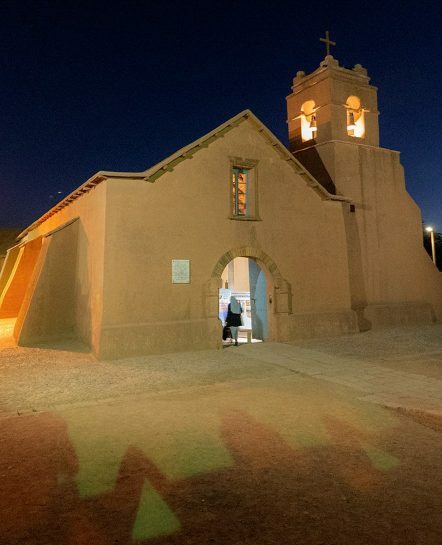 A picturesque adobe settlement, San Pedro draws backpackers and nature lovers from around the world. They are drawn by its famed volcanoes, geysers, rock formations and desert landscapes, as well as its rich ethnic and agricultural history. Our adventure begins with our arrival at the Calama airport, located 90kms from San Pedro de Atacama. A 1.5 hour transfer will take along a route that leads to our delightful hotel an oasis of charm and luxury in the town of San Pedro at 2500 meters, the base of our excursions. Arriving at the hotel, we will take a free time to check in, relax and acclimatize, important for the rest of our days in the high plateau. In the afternoon and before dinner Ossian will present the itinerary and take any questions you may have. In the evening we will have a welcome dinner at a local restaurant. Departure early in the morning to travel the 90km of mountain road that separates us from our final destination Tatio geysers. We will be surprised by the sunrise in the middle of a geothermal field at 4300masl, surrounded by steam and boiling water emanating directly from the center of the earth. Third in dimension in the world, the particularity of these geysers lies in their height since they are the only ones found in the high plateau and surrounded by volcanoes, which makes them owners of a unique magic and beauty. After taking pictures with the first lights of the morning we will share breakfast in the field. At midday, we will return to San Pedro to enjoy our lunch. In the afternoon we will go out to explore another of the unique beauties of this desert, the salt mountain range, unique for its red clay color and for its heart of salt. We will travel its geography to position ourselves to wait for a beautiful sunset with a delicious coffee. Before sunsrise we will head towards Tara Salt Flat, located about 150 km east of San Pedro, towards the Jama border with Argentina, passing by the Licancabur volcano and Hito Cajón border with Bolivia. On the way we will reach a maximum height of 4800m, then descend and enter fully into the geography of our excursion. This salt flat is located on a super volcano or inactive caldera of 140km2 at an altitude of 4300m and is part of Los Flamencos National Reserve and Ramsar site (protected flamingo nesting area). The road to access the salt flat is a stunning and only local guides know how to get there. This volcanic area presents unique and particular structures formed by the strong erosion of water and wind, such as the Pacana Monks or the Tara Cathedrals. We will have breakfast outdoors, while we do our photo shoot in the surroundings. We return to the hotel for lunch. We will take a free afternoon to rest, enjoy the hotel Spa and prepare for our intense excursion to Bolivia next day. Early in the morning we will take our transfer from San Pedro de Atacama to the Bolivian border, passing through Chile and Bolivia migration. Once at the border, we will change vehicles to a comfortable 4×4 for 4 people. We will enter the Eduardo Avaroa Andean Fauna Reserve to visit the beautiful White and Green Lagoons located at the base of Licancabur Volcano (5960m), (During our tour we will stay at a height that goes from 4300m to a maximum point around 4950m). A stop at Polques shelter (lunch and thermal baths), then continue our journey to Laguna Colorada, the only protected lagoon by its incredible red and white color. This lagoon is the nesting center for more than 30,000 flamingos of the three protected species that inhabit the Andes. We will return to San Pedro, changing vehicle again at the border, and doing the migration process Bolivia, Chile. After the long journey through Bolivia, we will take a free morning to rest and relax. Around 3:30 p.m. we will leave the hotel for our last sunset at Baltinache Lagoons or Hidden Lagoons. Its name is due to the fact that we will have to travel 50km to reach them, located in the southwest corner of the Atacama Salt Flat. This Lagoons principal atraction is the beauty of its colors. Formed by several natural saltwater pools with very intense green and blue colors. After sunset we will return to the town to enjoy our farewell dinner at a local restaurant. This day We will check out and transfer to take us to Calama airport.